My Dad and me at another lake at an earlier time. I think I'm two. Our second week at the house, a group of boys arrived at a nearby estate. There were ten of them, all about thirteen, all black, hailing from a place called “Inner City,” of which I’d never heard. These boys had been awarded this special trip as a prize for academic excellence in a program which was basically for smart kids from rotten schools. In addition to staying in a huge, old manor house and having access to a lake and the beautiful country, the boys were also taking enrichment classes in all the major academic areas. Sort of like The Fresh Air Fund meets Prep for Prep. The way I talked, which was nasal and squeaky with prominent r’s, amused them. They’d howl and slap each other’s hands as someone else would come up with a question for me, just to hear me talk. The reason my dad got such a big kick out of these boys was that he had been one of these boys. He had grown up in the thirties on the South Side of Chicago, part of what was referred to as “The Black Belt.” His father—whom I never met because I was born too late—was a Pullman Porter, which meant he was always employed, even throughout the Depression. So compared to those around them, my father’s family was not poor–my grandmother even took to leaving meals out on their front porch for those who had none. Nevertheless, they were still black; they still struggled and faced the same kind of pervasive racism that all “colored people” faced back then, regardless of class. It was immediately apparent to everyone that my father was a smart little boy, taking after his brother, Stan, who was eleven years his senior and clearly headed for University. My father wore glasses from an early age, which no doubt helped people take his intellect seriously. But it was more than that. By seven, he was reading everything he could get his hands on; by ten, under his brother’s tutelage, he could differentiate Mozart from Beethoven from Schubert. In Nineteen thirty-seven–seventeen years before Brown versus the Board of Education–my father was one of a very few black students who began attending a white high school, where he joined the staff of the school newspaper, ultimately becoming its chief cartoonist. 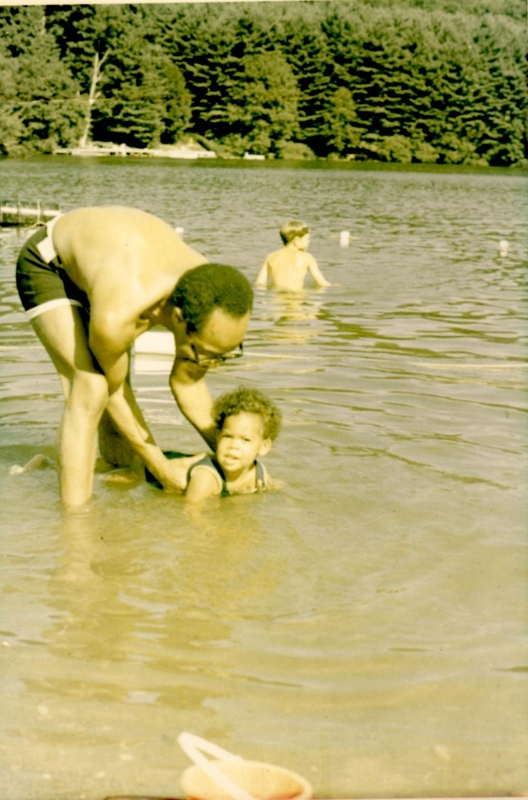 Watching those boys at the lake that summer brought my father back to his beginnings: what it was like to be young, black, smart and way out of place wherever he went. He never talked to me about those days when I was a kid, only when I found drafts of his memoirs later on and asked about them. What stories he did tell me of black life in the 1930s on the South Side of Chicago involved a world very far removed from my own. I spent my whole childhood without a single overt incident of racism—that I noticed. I know I was raised in a bubble: a city where biracial was common, a private school where the black kids were no different socioeconomically from the white kids. I had no frame of reference for relating to my father’s tales of segregation and fear. Also, my father’s job in publishing meant later hours and more business trips than those of my mother, who was a teacher. Mom was with me more, meaning I negotiated the world accompanied by a white, educated woman. We may have gotten more than our share of looks when we went places together, but that was an easy trade. No matter where we went, my mother’s race provided access. Still, the trials my father endured as a youth, the character they built in him, paved the way for me to have a very different sort of life, in a different sort of time and place. From Untitled Memoir by Mel Williamson (The manuscript is undated, but he worked on it continuously between 1985 and 1994. ) This excerpt takes place in the summer of 1940. This entry was posted in Cultural Context, General Identity, Interracial Marriage, multiracial identity, Parenting Biracial Children, Uncategorized and tagged Black, Black Belt, Class, Depression, Inner-City, Lake Michigan, Pullman Porter, Racial Dividing Line, racism, Summer. Bookmark the permalink. Lisa, you are such a gifted, insightful writer. You take us with you. I’m always delighted whenever a new post appears in my inbox. I know it will be excellent. Thank you Scrollwork, for your kind words. They made my day! I love the juxtaposition between the lake in Chicago in the ’40s and your experience in the ’70’s. Also, love the “collaboration” between you and your father. Very strong and heartfelt writing—with a lot of quiet knowledge transfer. Thanks for sharing you journey, Lisa! Thanks Nicole. It is kind of amazing to dig through his old works and find hidden gems from his life! Awesome writing and interesting/educational story. Truly a shame that racism exists and the levels at which it existed in the past is just unimaginable to me. I’m not old, but even in my little country farm town where I grew up there was racism. From what I remember it was 99% white and maybe 1% Mexican. Not even one black person, so obviously the racism was based on ignorance. Even that town has changed greatly in 20 years and now I even see many black people there. From what I see here, a decrease in racism has definitely occurred.